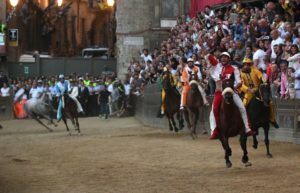 After a delay of nearly an hour, due to the fact that horse representing the Tartuca contrada (neighborhood) refused to join the lineup (vets finally decreed he was stressed and he left Piazza del Campo), Giraffa won the July 2 Palio di Siena. L’Aquila was a close second. In the lead almost from the beginning, Giraffa was guided by jockey Jonatan Bartoletti. Living up to his nickname ‘Scompiglio’ (Confusion), Bartoletti emerged as the victor of the Palio for the third consecutive time (he rode for the Lupa contrada in July and August 2016). For reasons of security, the audience in Piazza del Campo was limited to 12,000 spectators and ages 12 and under were not allowed to enter. To read more in Italian, and to see a photo gallery, visit Florence’s La Repubblica news site.